It's no secret how much we love to eat out most especially when our friends are there to join us. However, one thing that can really dampen our hungry spirits is having to queue up for a long, long, longggg time. Since patience is obviously not my strongest point, I make it a habit to do table reservations as often as I can. Back then, I would go through the trouble of calling the restaurants days before to do this. However, there are moments when we suddenly decided to eat out and knowing that I didn't had ample time to make the reservation, stress level would tend to rise. That was until Paul and I were invited to join a fun food trail one weeknight and this was hosted by the cool folks behind Quandoo Singapore. 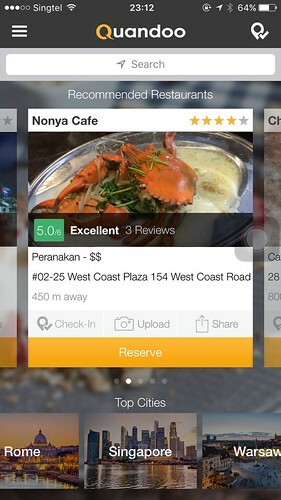 For those who haven't heard about this, it's actually a mobile app that will allow you to make a table reservation with just a few clicks and you can do it right on your mobile phone. Sounds awesome, right? is giving away $100 dining vouchers to one lucky blog reader so hang on. I'll tell you more about it in a while. Since knowing about the app is not enough, we had the chance to dine at 4 of the many partner restaurants that are part of the app. We started our food trail at Bar-a-thym near Club Street where we had a refreshing plate of Ceviche of Yellow Fin Tuna with Apple-Fennel Salad drizzled by Yuzu Ponzu Dressing (S$24). 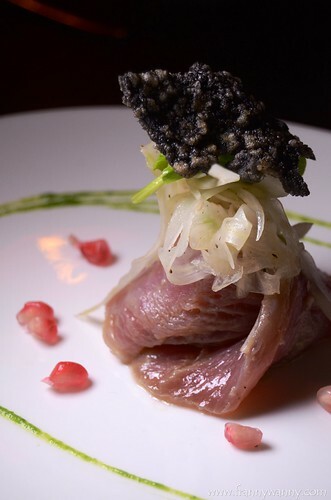 I enjoyed the contrasting textures of the silky fresh seafood and the crunchy squid ink cracker sitting on top. The best way to enjoy this is to pair it with a glass of white wine or some bubbly champagne. After enjoying our starter, it was time to head to our next destination. 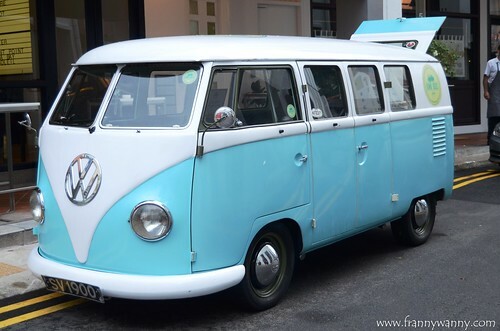 Of course, Quandoo Singapore made sure that we travel in style ... in retro style! Parked outside Bar-a-thym are two vintage VW Kombi vans from Kombi Rocks which apparently were our transport service for the night. To say that I was excited was pretty much an understatement. I've never ridden in a Kombi van before so I was looking forward to this opportunity! Okay, well the inside really does feel very...vintage-y. 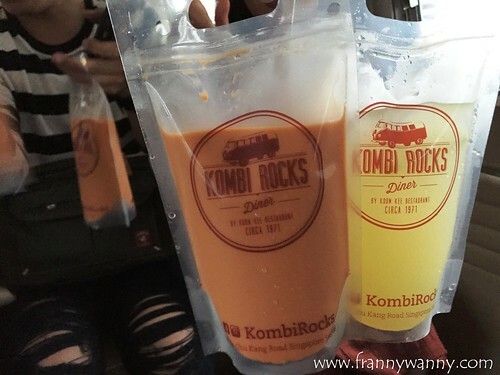 What made our ride fun were these bags of Iced Lemongrass Tea and Thai Iced Tea which was perfect since it was a pretty humid and warm evening. They even gave out bags of salted egg peanuts too! That's service deluxe in a combi. Surely, can't get that anywhere else. Our next stop was at Golden Peony in Conrad Centennial Hotel. Honestly speaking, I was most excited about this among all the 4 stops in the food trail. I've been wanting to try Golden Peony after hearing endless raves from fellow food bloggers. I'm happy to share that our meal at Golden Peony didn't disappoint at all. In fact, I love everything about it! 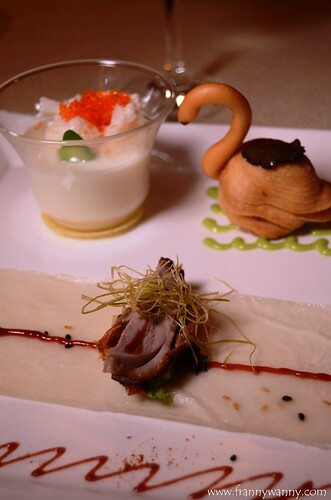 We had Chef Ku's Signature Trio Platter which had Steamed Lobster Meat on Egg Souffle served with Fish Roe (S$18), Swan Pastry with Chicken, Foie Gras and Truffle Oil (S$9.80) and lastly, a very mouth-watering piece of Peking Duck with Parma Ham, Pineapple and Crispy Beancurd Skin rolled in Homemade Crepe (S$14). It's very difficult to choose one that I loved the most but if I really have to then it would be the Swan Pastry. Surprise surprise! For someone who's not a fan of anything too flaky or buttery, this one was really good. I can't forget that moment when I bit into the "body" of the swan and I can smell that amazing aroma of truffle and I can also taste the buttery texture of the foie gras which complemented the chicken meat inside. So good! The Steamed Lobster Meat Souffle was good but it can get too rich and filling after 2-3 spoonfuls. Meanwhile, the Peking Duck Crepe was delightful as predicted. 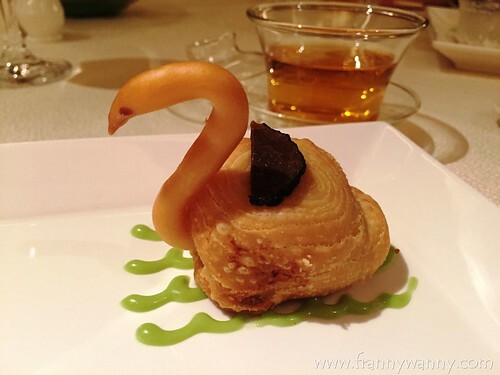 It was really the Swan Pastry that caught me by surprise. 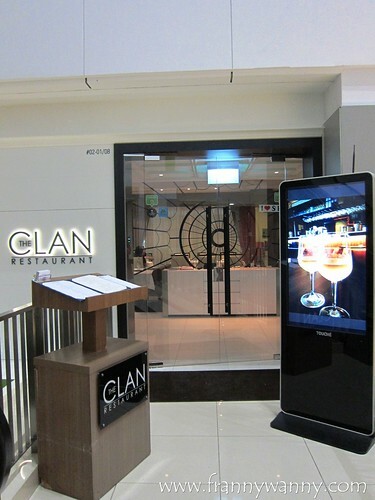 After enjoying our meal at Golden Peony, we headed to Dhoby Ghaut where The Clan was located. We were told that it's a modern European restaurant so in my mind I wondered what does it really mean by "European restaurant?" Is it a mix of French, Italian, British, Greek, Spanish cuisines to name a few? I was a bit surprised and I was looking forward to trying The Clan in hopes that my question will be answered. 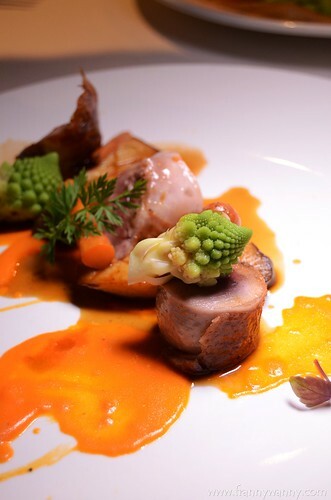 Normally, food trails mean getting tasting portions of a dish or two in every stop. The Clan aimed to please and presented not one, not two but five different dishes which we shared. 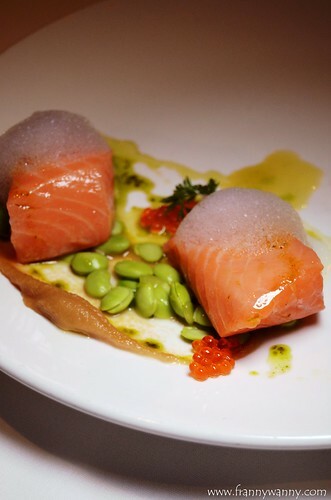 My favorite was the 44C Salmon with Edamame and Sea Foam (S$42). A bit too pricey for a small serving but I guess the high price has something to do with the ingredients used and the cooking technique behind this. Anyway, the fish melts in your mouth and it has a nice subtle flavor which leaves you wanting more more more! 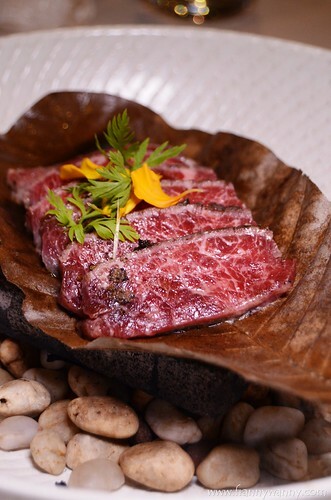 I also loved the Wagyu Beef Loin with Himalayan Pink Salt and Jus (S$48). This one seems to be much more worth the price since you're getting 6 juicy slices of tender Wagyu steak which comes sizzling on a piece of hot stone. I love how they present their dishes. It's just so pretty! The meat was so soft and that marbling was just amazing. 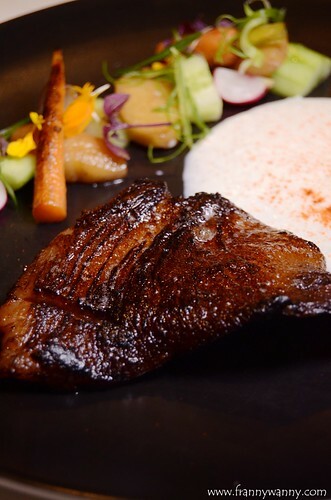 If you love pork then try the Iberico Pork Jowl with Smoke Celeriac, Japanese Cucumber and Apple Slices (S$38). It has a nice smokey flavor which reminds me of those barbecued bak kwa that's famous here during Chinese New Year but it's definitely much more classy and tender than that. I love the crunchy, caramelized outside while the meat inside stayed soft and juicy. 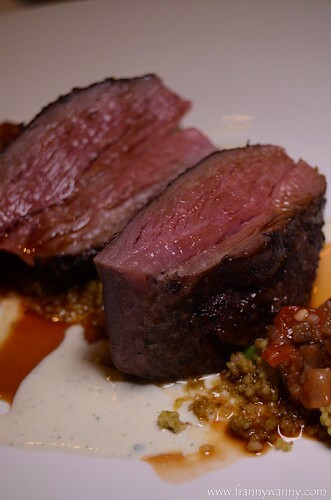 We also had the Young Lamb with Yogurt Mint and Couscous (S$44) which was a okay but a bit too chewy for my taste. We spent the most parts of our evening at The Clan as we slowly enjoyed each dish. However, it was time for dessert and off we went to our 4th and final stop. It was past 9pm when we got to Orchard but luckily Laurent's Cafe was still open and ready to serve us. Thank goodness as I was totally craving for sweets and cakes after several savory dishes. 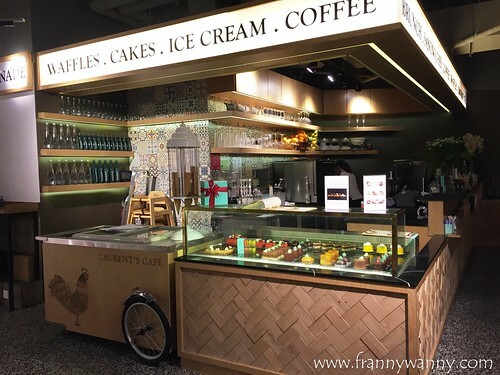 Laurent's Cafe is the brainchild of Laurent Bernard who is a French artisan chocolatier here in Singapore. I've had Laurent's chocolate truffles before which was why I kept on telling myself that the chocolates on display just looked so familiar. That evening, we had a medley of cakes! Hooray! The Exotic (S$10.50) is a combination of coconut, passionfruit and yuzu. It has a very strong citrus flavor making it the most refreshing creation among the 4 cakes that we've tried. This somehow balanced it out with The Feminity (S$10.50) which was a rich and gooey chocolate dome with raspberry. Inside, it has a nice creamy texture similar to a chocolate mousse. 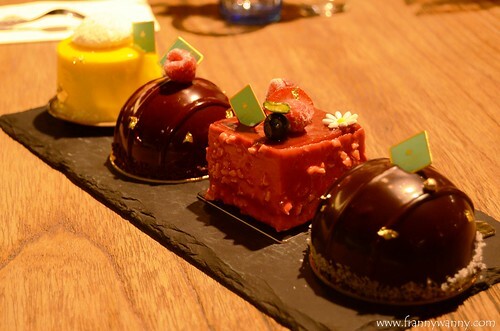 The Carre Braise (S$10.50) is the cube-shaped cake which consists of strawberries and vanilla. If you ask me, this would be best called "Feminity" as it's every woman's favorite flavor. Well, I guess, ladies love chocolates too. Lastly, the Pleasure (S$10.50) is another dome creation with milk chocolate mousse and hazelnut. I had the "pleasure" to enjoy this and if you ask me, it's one of the yummy, most indulgent cakes that I've had. So yummy! Time flies when you're having fun and in our case, we've reached the end of our meal and it was really close to bed time. It was a delicious and memorable experience spent going around town onboard a kombi and trying all these interesting creations. Now, it's time for the giveaway! From today until 30 June 2016, simply make a reservation at any of the four restaurants that I've mentioned above and use the link on the restaurant names too. By the end of the month, we will be choosing the lucky winner who'll receive $100 dining vouchers! Good luck to all and be sure to save waiting time by reserving your table! 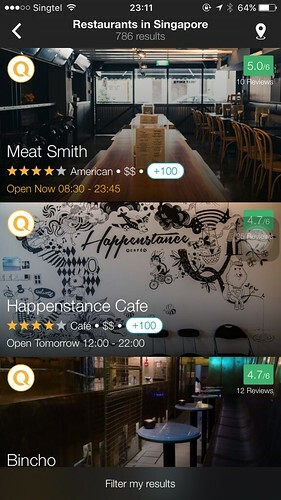 Quandoo Singapore is available at the Apple App Store and on Google Play. Download now!